LONG BEACH, Calif. – Jan 30, 2017 – Epson, a leading provider of innovative business solutions, today announced Keypoint Intelligence – Buyers Lab (BLI), the world’s leading independent evaluator of document imaging software, hardware, and services, has recognized Epson’s innovation for its business printing and scanning solutions. The WorkForce® ET-16500 EcoTank® All-in-One Printer received BLI’s Winter 2018 Pick for Outstanding Achievement Award in Value. The WorkForce DS-320 Portable Duplex Document Scanner also received BLI’s Winter 2018 Pick Award for Outstanding Mobile Scanner for Business. The BLI “Pick” awards occur twice a year, in Summer and Winter, giving special recognition to the hardware and software products that are reviewed by BLI’s team of expert technicians and analysts at the BLI lab. All laboratory test data is then compiled to select the top products that have been evaluated within the past six months. The products and solutions that stand out from the competition, providing the most outstanding performance with the highest evaluation scores, are then awarded a Pick award within their respective industry category. WorkForce ET-16500 EcoTank Printer: Powered by PrecisionCore® printing technology, this all-in-one wide-format printer offers revolutionary cartridge-free printing with easy-to-fill supersized ink tanks. The WorkForce ET-16500 EcoTank is designed to deliver laser-quality black text and includes up to two years of ink in the box - enough to print up to 10,500 black/11,000 color pages, and equivalent to about 50 ink cartridge sets. Featuring a 500-sheet paper capacity and rear specialty-paper feed, plus a 4.3" color touchscreen for easy navigation, this wireless printer can print up to 13" x 19"and can copy and scan pages up to 11" x 17". 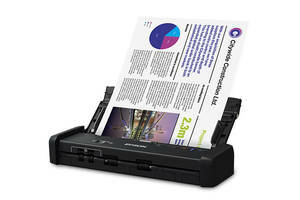 WorkForce DS-320 Document Scanner: Delivering the fastest scan speeds in its class, the DS-320 compact duplex document scanner offers speeds up to 25 ppm/50⁵ ipm and features a 20-page Auto Document Feeder (ADF). This portable scanner also includes TWAIN and ISIS® drivers for seamless integration with existing document management systems. Scan to online storage accounts6 like Dropbox® and SharePoint®, or to searchable PDFs and editable Word and Excel® files using the included software.